The MACSQuant Tyto Cartridge provides a completely closed and sterile system, protecting samples from environmental contamination. 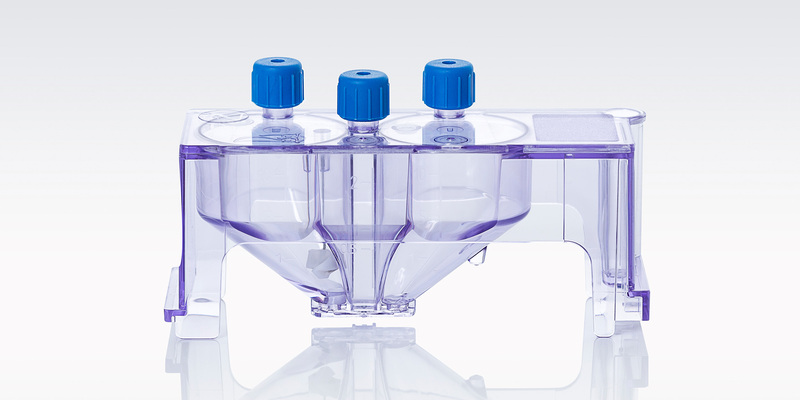 In contrast to conventional droplet sorters, the MACSQuant Tyto Instrument does not use droplets to separate cells, eliminating biohazardous aerosol formation. 0.1 µm hydrophobic filters on top of all chambers of the MACSQuant Tyto Cartridge allow for a sterile ventilation of your sample. Additionally, the air used to pressurize the input chamber to control the sorting flow is pre-filtered. All MACSQuant Tyto Cartridges undergo a validated and strictly monitored sterilization process using ethylene oxide, guaranteeing fully sterility. The closed character of the cartridge in combination with guaranteed sterility of each cartridge lot, for the first time enables safe and controlled cell and gene therapy manufacturing. The MACSQuant Tyto Sorter is easily operated by lab professionals without intensive training. Cartridge identification is performed by a barcode scanner which automatically detects the type of cartridge. Loading of the cartridge into the instruments proceeds in an intuitive “plug-and-play” fashion. Flow control, laser alignment, speed detection and valve timing are all fully automated processes, thereby eliminating the need for specialized technical expertise during daily operation. Automated sort setup for a variety of applications adds to the MACSQuant Tyto’s ease of use. Conveniently, the actual sorting process is completely hands-off, saving time, resources and thus money. Additionally, 24/5 troubleshooting may be performed by our technical support team with real-time access to your instrument using the remote support function. Find out more about the easy cell sorting procedure on the MACSQuant Tyto: It’s simple, it’s gentle, it’s sterile. This video will give you an overview of the straightforward operator steps from sample loading to retrieval. The single-use disposable cartridge completely eliminates the risk of external contaminations and sample-to-sample carryover. 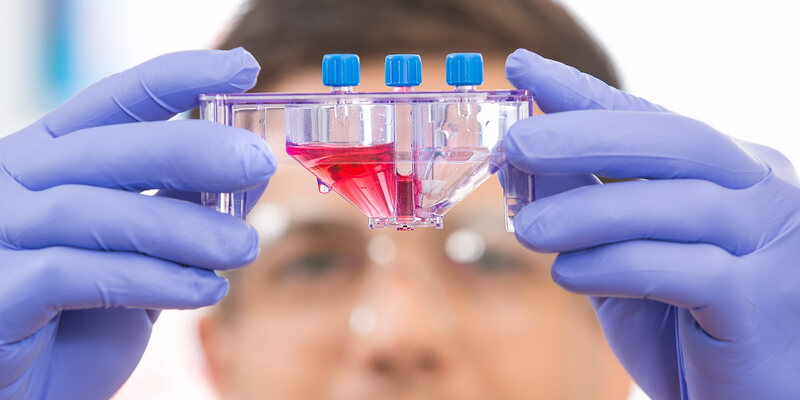 Therefore, you can be confident that your sorted cells are ready for use in sensitive downstream applications such as cell culture, cell expansion, and medical applications. Due to the closed character of the cartridge no biohazardous aerosols are formed, resulting in minimized operator risk. The MACSQuant Tyto Sorter allows for completely safe sorting of cell material, such as bacteria, yeast or potentially contaminated cells without any risk for persistent contamination of your cell sorter. Additionally, a time-consuming cleaning routine of the instrument between samples is unnecessary, saving time and money. Unlike on conventional droplet sorters, cells sorted by the MACSQuant Tyto Sorter do not experience high pressure. They do not get decompressed and no charge is applied. This gentle sorting approach results in never-before-seen viability and functionality of cells. The MACSQuant Tyto Sorter is equipped with a temperature-controlled cooling unit, stabilizing your samples at a temperature of your choice, ranging between 4–25 °C. Sorting on the MACSQuant Tyto allows the retrieval of both negative and positive sort fractions. In combination with the gentle sorting approach subsequent sorting of different populations from the same sample can be performed without affecting viability or replating efficiencies. Additionally, pre-enrichment of rare cell populations is an application that can be executed on the MACSQuant Tyto by performing two subsequent sorts on the same population.